History? Sort of. Horrible? YES! If you live in the UK you're probably familiar with the Horrible History series of books from author Terry Deary; featuring illustrations by Martin Brown. They're books aimed at children (mainly boys) between the ages of 8-12 which try to make history fun by discussing the nastier bits of it; using humourous illustrations and a light-hearted style to increase appeal. They lack citations which would prevent them from qualifying as "real" history books, but they're good fun and if they spark interest in further reading by the target audience then they'll have achieved their mission. After more than 20 years in publication it's probably safe to say they're doing a good job of it! The idea of a game based upon the Ruthless Romans entry in the series is certainly interesting: many kids are already playing video games by the time they hit the target age for the books and Roman history is a vast subject with many game possibilities. It is the latter which makes the decision to create a mini-game compilation based around the license so disappointing. There are a few game modes with the main one being Story Mode. All involve playing the same mini-games, but Story Mode has the benefit of a decent narrative to string them together. The player takes control of a young Dacian slave named Rassimus who is owned by a Roman general, Lucius Gladius. Lucius invaded the boy's village and took him as a good luck trophy since he was in the tent Lucius took shelter in when the battle started turning against him. Now that he's grown, Lucius has decided to make some money off Rassimus by putting him into the arena as a gladiator, but he needs to train on the way via mini-games...lots of mini-games. There's further narrative as Rassimus seeks to escape Rome and rejoin his family, through events punctuated by yet more mini-games. The sections which set up and progress the story are narrated by the author with accompanying stills presented in comic-book fashion. Mr. Deary does a good job of presenting events in the manner you would expect of someone telling a story to children and the evolution through the game is handled well maintaining interest in seeing things unfold. 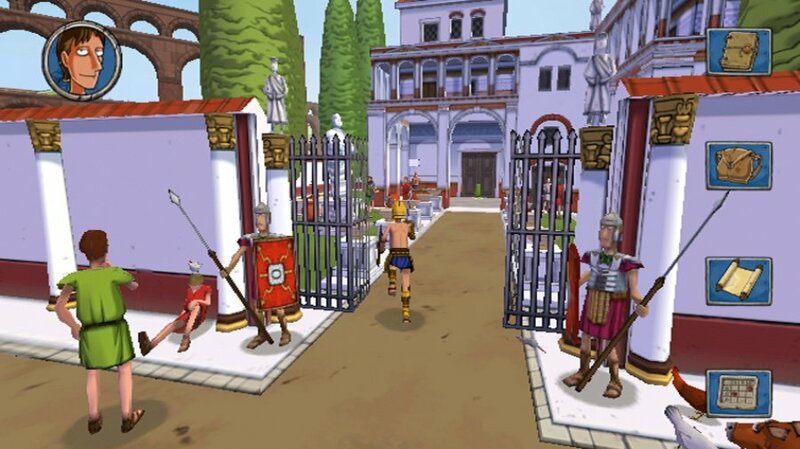 It allows for an exploration of various aspects of Roman life and gladiator training which leaves one wondering why publisher Slitherine and developer Virtual Identity (a small Italian company whose other Wii credit to date is Pirate Party: Adventures of the Black Corsair - not to be confused with WiiWare title Family Pirate Party) didn't choose to create an adventure game or visual novel instead. 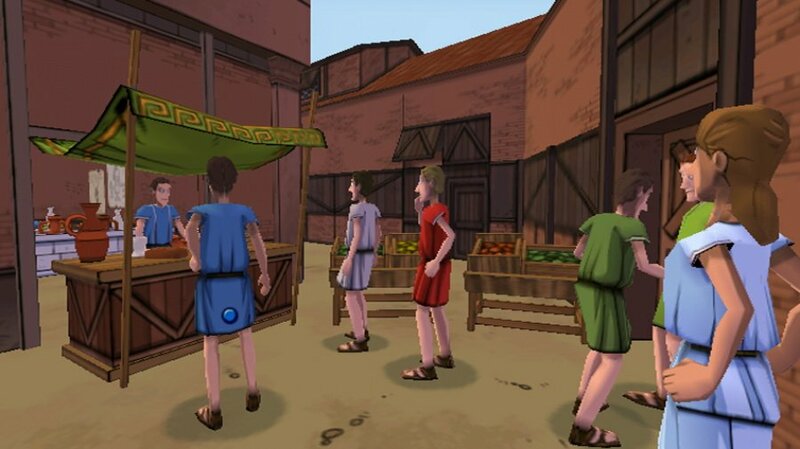 Outwith the mini-games the player controls Rassimus directly in a 3D rendering of Rome bounded by the Colliseum and the trader's guild. Buildings are 3D polygons with flat features and textures in the style of the book illustrations, with a few boulevards largely devoid of life. There are certainly figures about, but for the most part they are static like waxwork dummies, though some engage in repetitive movements like some Disneyland animatronic rendering of Horrible Histories Roma. Rassimus runs full-tilt in whatever direction the D-pad is pressed. It's not always a great experience, but gets the job done. Initially you start out in Lucius' gladiator school with dotted lines showing you where to carry out training (play mini-games), but after the first gladiator bout (mini-game) these disappear. You have a map you can access via an icon in the sidebar, but it's very general and doesn't help navigating within your immediate vicinity; nor does it highlight your targets. As a result you can spend a good deal of time simply trying to get your bearings and find the next mini-game/plot point. Doors with green arrows in front of them can be passed through by pressing A; otherwise they'll have red padlock icons; anything else you can interact with is marked by a set of gears, or rolling die (mini-game); nothing else can be explored. You can talk to characters with speech bubbles over their heads which results in seeing text against some rather annoying "blah blah blah" gibberish talk. You cannot pause the chat, but can skip past it. Unless you've been given reason to talk to characters via some other event those few people you can talk to will just tell you to move on. Any activity that results in a task will result in a stone bust coming on screen to announce it; every one you complete results in another stone bust coming in from the other side to tell you you've completed it. Each of these interruptions requires an A button press to continue which gets a bit tiresome after awhile. Task progress can be viewed by clicking on the diary icon in the sidebar during the 3D roaming part. Your main task is to complete training through the various gladiatorial styles. Completing each of these consists of finishing three mini-games, asking Lucius for permission to fight in the Colliseum and then taking a reward tile back to the school to put in a wall; thus marking your achievement, before moving on to the next. 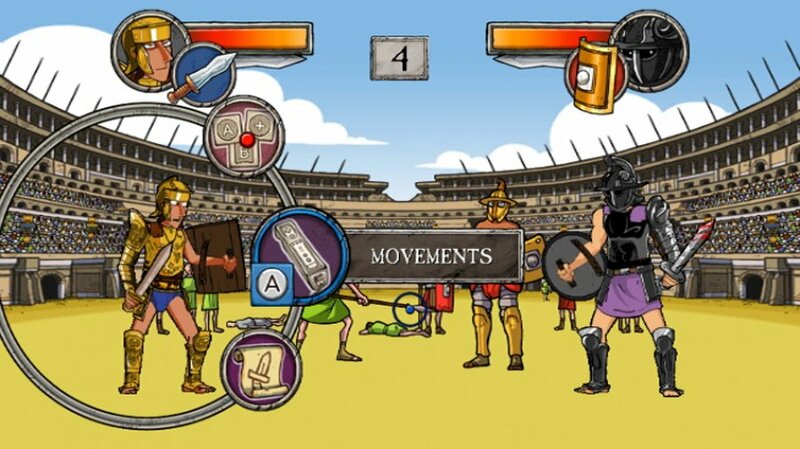 The mini-games are a quiz, general training mini-game and style-specific mini-game followed by the gladiator battle mini-game. All mini-games bar the gladiator fight can be played by up to four players, though only player one can control Rassimus in the overworld whilst others watch. 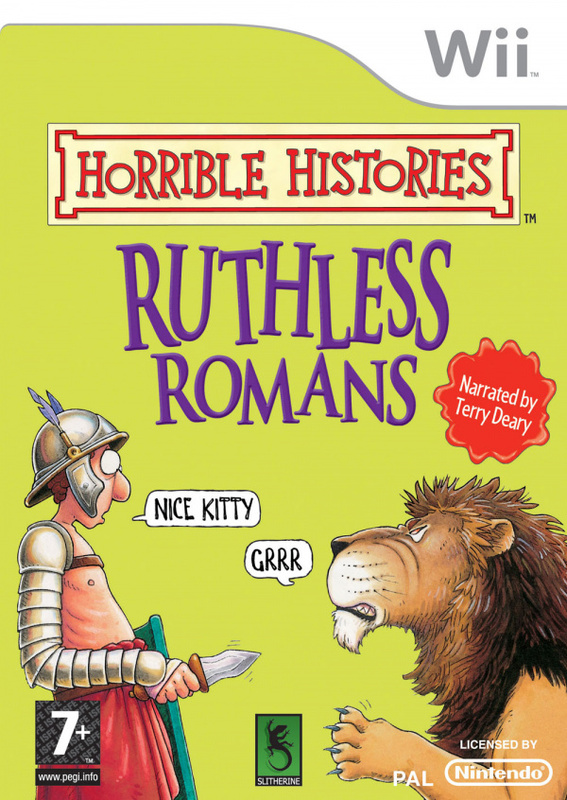 The quiz consists of a series of questions based upon information in the Horrible Histories: Ruthless Romans book which is helpfully repeated in-game in various tomes scattered throughout the game world. Since the special edition includes the book, it's better to read that and save yourself running all over the place trying to find books of the relevant colour for the current quiz (you can learn this by talking to the teacher in the gladiator school lecture hall). The questions have nothing really to do with the gladiator style being worked on and are multiple choice. The general training is a simple point-and-click game with additional elements being added as you progress to increase the level of challenge. Initially you simply click flashing sections of a straw dummy, then moving targets are added and other aspects come on as the game progresses. 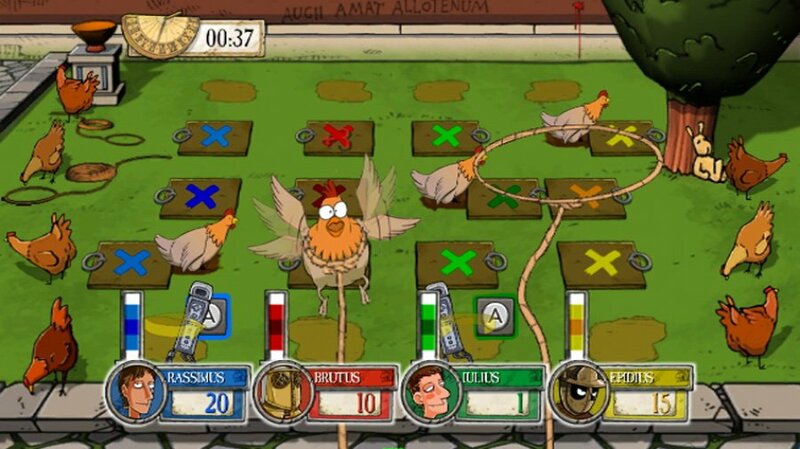 It's one of the better mini-games, though unlikely to challenge any experienced gamers. The gladiator style-specific mini-games are vaguely relevant to the fighting style, whether the one with the net and trident, rope and spear, spear and beasts, two swords, etc. None of them are particularly memorable or offer much challenge though they may be more amusing within a group. After completing the "training" in the different gladiatorial styles you'd think that the ensuing gladiator battle would change depending upon the gladiator being faced, but you'd be mistaken. A 2D animated presentation awaits with the player on the left and the opponent on the right. Choose the method of battle from a choice of pressing button combinations, making prompted motions or tracing outlines with the pointer and then watch Rassimus and the fearsome opponent march towards each other and disappear into a cloud of dust and fists a la an old Popeye cartoon. Brilliant. Damage is assigned based upon how well the player does in whichever of the mini-games is chosen by himself or the CPU. The only difference between the different fights is the gladiator model and a slight increase in difficulty. This can be played as a standalone game; optionally against a human opponent where you take turns choosing the rock-paper-scissors variant with the winner being the last one standing. You'll be given an option to rematch if you enjoyed this, which is unlikely. The best part is the story aspect where the player is given various tasks to complete in order to escape Rome and rejoin his family in the Dacian village he was abducted from. There are more mini-games, but at least they're more relevant to what's happening and there's a feeling of greater participation in the narrative for the player. You'll still need to complete the gladiator training, but at least there's some nice interludes to prevent utter boredom and despair! The back of the box promises "over 30 mini-games!" and it's not false advertising since there's a total of 31 (including the Quiz), but quantity rarely trumps quality and that's certainly the case here. 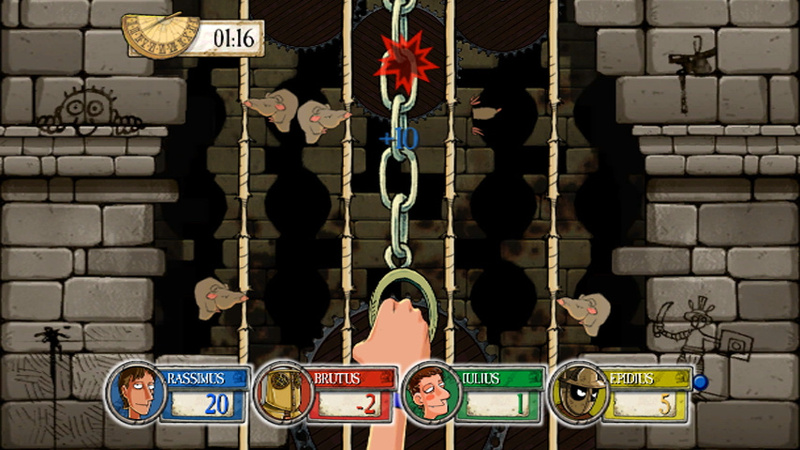 Many of the mini-games are related to specific aspects of the game's story mode and don't work too well outwith that context or barely meet the definition of a game (see the "invitation completion" game where you press A and motion up to request a new invitation then waggle back-and-forth to melt wax to create a seal and then click B and motion down to stamp the seal - repeat until carpal tunnel strain forces you to stop). The motion implementation is mixed and probably isn't going to do your wrists any good. Simple waves and thrusts are picked up with a minimum of effort which is great for younger players, but actions like side-to-side waggle and circular motion require a good amount of effort that even an adult will find challenging; which is not going to be good for anyone. Memory and matching mini-games built around pointer use aren't bad, but they aren't strong enough to support the case for purchasing this game for any but the most dedicated fan (or parent convinced most games are a bad influence). 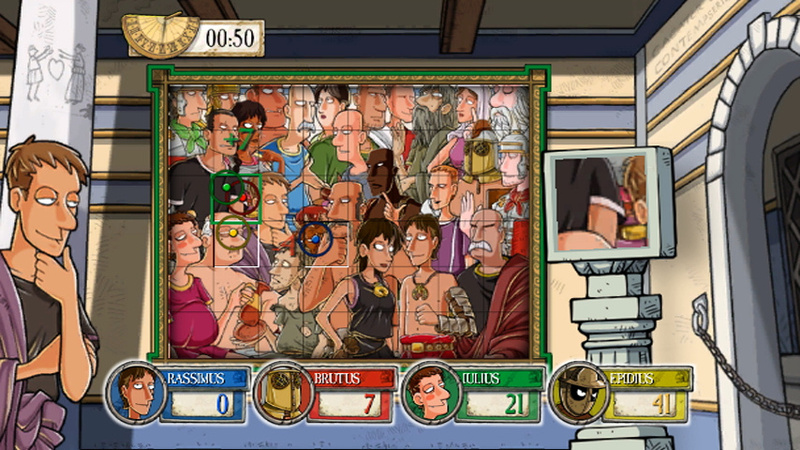 Once story mode is finished there's no real incentive to replay, but there are a few multiplayer options: Versus Mode is the gladiator battle as described above, in Mini-Games you choose an assortment of the mini-games on offer tournament-style and finally Conquest is a board game where players take turns playing randomly chosen mini-games in an effort to conquer the Roman Empire. After choosing the number of players in your Mini-Games tournament you play them in sequence. As in the Story Mode instructions and rules are viewable before beginning. After winners and losers are determined each player is assigned a certain number of tournament points. Whilst this does keep other players from falling behind, effectively it also means that players who have a large lead tend to stay there; even when they lose one of the games. The tournament losers get produce and dead rats thrown at their banners after the final score is totaled. Nice. In Conquest difficulty is chosen based upon the number of territories that must be conquered with a total between 3 and 6. This seems a bit odd given there's a minigame where players are supposed to click on shapes representing a couple dozen Roman territories - why limit the scope? 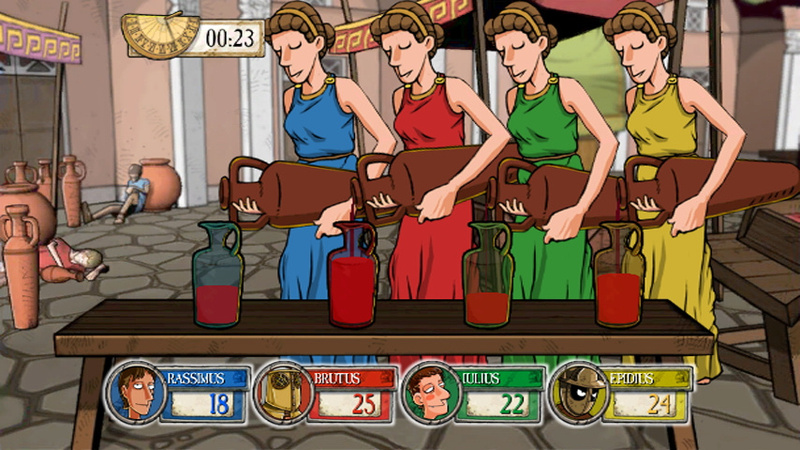 On each player's turn they get to choose the Roman territory on the map to try for and play a mini-game randomly selected from the 31 on offer (a picture representing the mini-game to be played or standard board game alternatives like "miss a turn" come up as if in a one-wheel slot machine). If the player wins the mini-game they get the territory; otherwise it stays unclaimed. The outcome is skewed by each player getting bonus points for it being their turn; in the case of a draw that means the player whose turn it is always wins. This game and the tournament mode might work better with more than two players, but losing players in either case are unlikely to find having a pile of poo next to their name terribly amusing! Given publisher Slitherine's previous track record of PC games based upon tabletop miniature wargames, Ruthless Romans is a bit of an anomaly. One wonders if they wouldn't have been better off using the license to build a wargame that might better appeal to their traditional target audience. After our experience of Horrible Histories: Ruthless Romans they would be well-advised to base any future Wii release upon one of their existing brands! Horrible History: Ruthless Romans isn't a terribly good game. The Story Mode is the highlight, though the story itself is wasted given the lackluster quality of most of the mini-games on offer. It's likely that younger players will get some amusement out of it, but not that likely they'll be playing it without Mum or Dad who are the real target market given the "edutainment" nature of the game. There are so many better game choices for younger players that if you've decided your under 10s should be playing video games there's no real reason to choose this one. Why make a game on this? Looks appropriately scored. Ouch, but I hope it fails. And it will! The Horrible History books are great - my daughter has a few and I find them really funny - but it's not a series you can really adapt to the video game format. This never seemed like a good fit for a video game version and the score just shows that. The books though, are still pretty good for younger kids. I remember reading some ages ago, they were great. Never read the books, and this game looks terrible. Question: Why review this and not something people actually care about? This game spells out two words:EPIC FAIL. I really think if they had gone with a visual novel or adventure game style there could have been a decent game here --- not necessarily a great one, but one that would be more enjoyable. I suspect that this would have required more work in the design department which means more time and money; this just looks like a quick cash-in, sadly. Heh, I saw that on the shelves and wondered who'd make such a box art. Dont listen to this reviewer. It sounds like he/she never even played it. I have played in nonstop for the past 3 days and let me tell you... IT IS AMAZING. Gotta go play more of this revolution of fun, later yall off the chain! The book series is pretty good, I used to read it. As for the game, it dosen't look like too much fun, but still, who knows. @Bahamut ZERO... games "people care about" are typically reviewed on n+1 other sites as well. I like to see reviews of more obscure games since it's possible the game might be better than I'd expect and without that, I'd completely miss it. This summer I got into contact with the Wii game "Diva Girls: Princess on Ice" by accident. The only clues I had as for what the game was like were the back cover, a trailer or two and just as many YouTube video clips. I ended up not even opening the wraps on the game since I had no clue what the game was like. And I still wonder if I would've liked the game -- it did support Balance Board according to the case cover. I think I read the book, but it's not called horrible history around here.